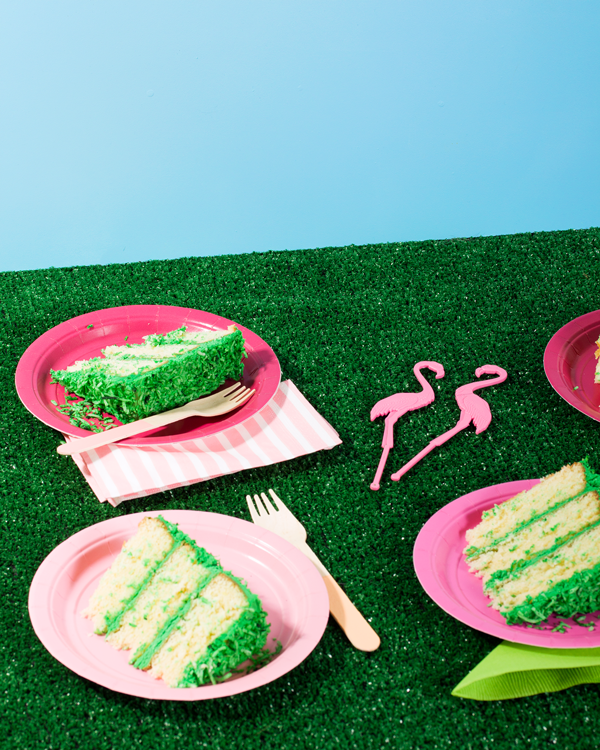 Flamingo Lawn Cake & a Giveaway! 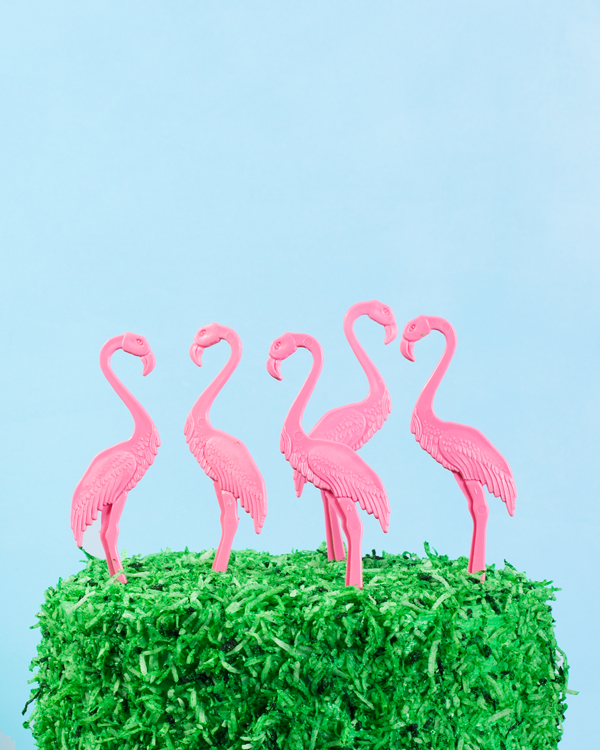 The moment I laid eyes on these flamingo swizzle sticks in the Oh Happy Day Party Shop I knew I wanted to cover a cake with bright green coconut and stick ’em in the top to make what is now being called “The Flamingo Lawn Cake”. I knew I had the concept for the decorating in my head but to actually follow through I took steps and recipes from Tessa Huff’s new Book Layered: Baking, Building, and Styling Spectacular Cakes. She has all the info you need for making fun, professional cakes. There’s a whole range of difficulty so even if you’ve got two boulders for hands like me, you can accomplish something that looks great. 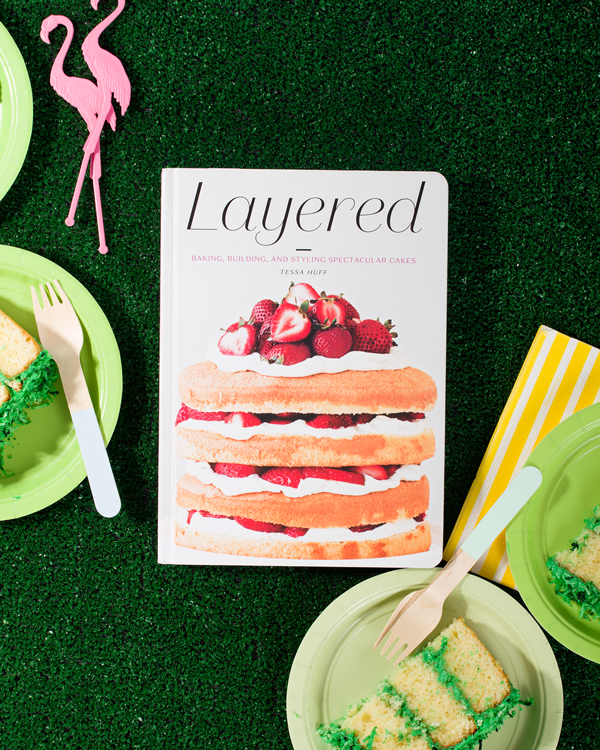 Good news is that this cake is on the easier end of the spectrum because we cover any mistakes with coconut, and even better news is that we’re giving away a copy of Layered! To make the cake: start by preheating your oven to 350 F and grease and line 3 8″ cake pans with a circle of parchment. In a large bowl sift together the flour, baking powder, baking soda, and salt and set aside. In the bowl of a stand mixer fitted with the paddle attachment beat together the butter, sugar, and lime zest on medium high speed until the butter is pale and fluffy, 3-5 minutes. Stop the mixer and scrape down the bowl. Turn the mixer to medium low and add the eggs and egg yolks one at a time. Stop the mixer and scrape down the bowl. Turn the mixer to low and add the flour mixture in three batches, alternating with the buttermilk, beginning and ending with the flour mixture. Mix no more than 30 seconds after the last streaks of the dry ingredients disappear into the batter. Evenly divide the batter between the three pans (I use a scale because I’m a freak that likes it to be exact but you could also use a large ice cream scoop to evenly distribute the batter). Smooth it out and bake for 25-28 minutes, until a toothpick inserted into the cake comes out clean. Let the cakes cool for 10-15 minutes before removing them from the pans. Place on a wire rack to cool completely. To make the frosting: In the bowl of a stand mixer with the paddle attachment, beat the butter, cream cheese, and coconut extract together until light and fluffy, 2-3 minutes. Add the sifted powdered sugar on low speed in a couple batches so it doesn’t go everywhere, beat until smooth then add in the food coloring until you get the desired shade of green. To assemble the cake: Place strips of parchment paper around the edge of the cake stand to keep it clean during the frosting then one of the cake layers on top of that in the center of the cake stand. Plop about 1/2 cup of frosting down and use an offset spatula to evenly smooth it out. Top that with another cake layer, repeat with another 1/2 cup of frosting then top it with the third layer. Use the offset spatula to evenly coat the cake in a thin layer of frosting to make a crumb coat then place the whole thing in the fridge or freezer for 20-30 minutes so the frosting firms up a little. While this happens tint your coconut by placing the coconut and food coloring in a zip top bag and massaging the two together until everyone’s the appropriate shade of green. Remove the cake from the fridge or freezer and take the remaining frosting and evenly spread it out all over the cake. Sprinkle the coconut all over the top of the cake then use the palm of your hand to place it on the side. Don’t worry if you drop some because we set up the parchment insurance. 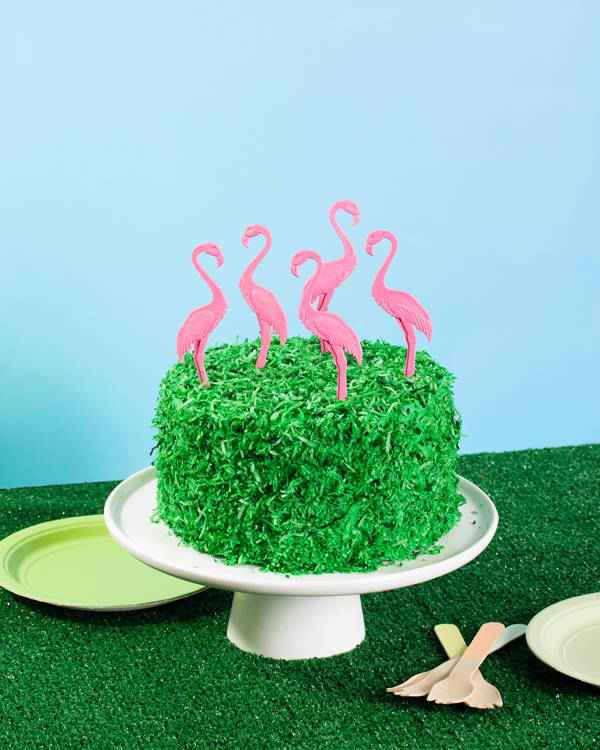 Once the whole cake is covered in coconut push as many of the flamingo swizzle sticks in the top, carefully remove the parchment strips, and serve. If not serving for a while just place in the fridge until your party. 1) Visit A mazon to read more about Layered. The giveaway ends on Monday, 7/25 when 1 winner will be chosen at random. Good luck! I love baking and making cakes for my son’s birthday. The rainbow layered cake in the preview looks DEVINE! I would love to make it! Yum!! This is such a cool cake! The minute I read coconut and lime I was in The other recipes sounds so yummy as well! I love making birthday cakes for all of my family, but I wish I was better at it. This book would be great! I love to bake cakes so having different recipes would be great! I’m currently in a massive bake-off with my husband and his siblings for our weekly attempt at coming alongside the Great British Baking show. Let’s just say I’m not in the lead, and could use a morale/technique boost. This morning I’ve become convinced this is my way to victory. 🍰. I love baking sweet treats, and looking at beautiful pictures of food (always)! Can you believe I have never made a cake from scratch? I would love to try making a cake that doesn’t start in a box! My husband loves cakes with fillings. I really don’t know how to add those in; I am afraid I will ruin the cake or make it soggy. This book might help break me into something new! I would LOOOOVVVEEEE to win this for a friend. She is my closest friend and we live in different states so I miss her terribly. She happens to be a fantastic baker and loves all things cook book. She also is about to receive her masters and get engaged (she has no idea). So, I have two pretty big gift giving occasions coming up! I want this book so bad! I design and bake cakes and dessert tables for events so this would be so perfect. I look forward to learning new techniques and recipes from Tessa, she is da bomb! Beautiful and delicious recipes, yes please!!! My people feel loved when I bake for them. I need help and inspiration! I Thanks for the chance to win. I FINALLY have an oven again! I love to bake cakes and would love this book to learn and create new cakes! I really love this idea it’s so bright and colorful! Great for summer and looks so good to eat! The book seems like it’s filled with amazing recipes and I can use some for my birthday that’s coming up in a few weeks! Oooh how sweet! I have had this book on my amazon wishlist for so long now. I’ve never had a book specifically like this, so it would be a welcome addition to anyone’s kitchen I would think. Does it seem strange that the flamingos don’t have one foot up? 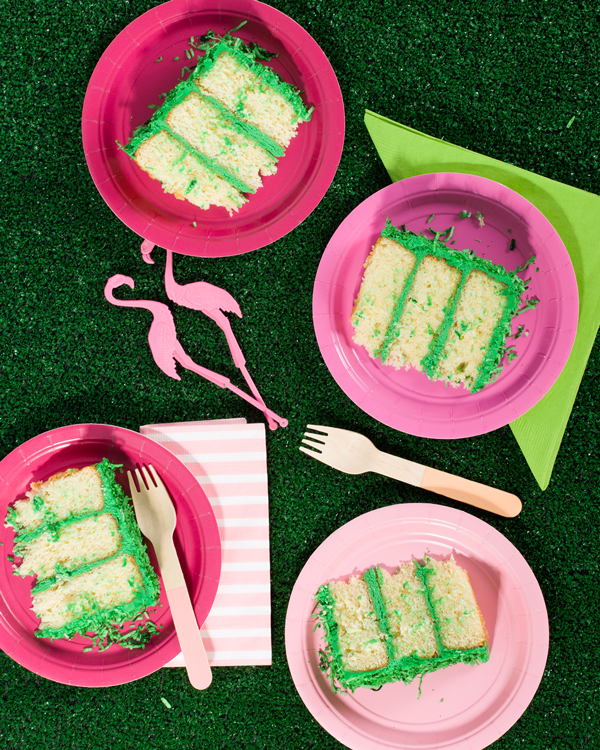 I am planning my baby shower right now and looking for cake inspiration. This would be a perfect place to find something special! I would love to win this for my sister in law! She bakes delicious cakes for all our family events. It would be nice to give her a random gift! I’d love to win so I can make my own professional looking and tasting cakes for celebrations. I have become the go-to friend in our group for all things baking and would love to add this book to my collection in order to get some new ideas and tips, especially since I am still an amateur baker! I was never into baking until I had little ones. I’m just a beginner but it’s been fun learning along with my kids. First off, the cover is gorgeous! I’m dying for something sweet now. And I’d love to learn the art of decorating cakes! Precious… I’m interested in art and would like to be able to do more kinds of art, especially the edible kind. The black forest cake in the preview looks like a twist on the casual and ever so more elegant. The boston cream pie looks simple but delicious. I have actually been looking at the Layered cookbook for a while and have been wanting to buy it! I would love to get more tips and ideas for beautiful cakes to serve at parties, her photos are to die for! YES! 150 unique recipes, easy to follow, pictures; what’s not to love? I would try the Coconut Mojito Cake first, then the Pink Peppercorn Cherry. Hello, YUM! What a cool cookbook. I love to bake, and I need some new inspiration! I’m addicted to baking and decorating cakes! i like to challenge myself each time and make something different. I have already made a couple of Tessa’s amazing cake recipes with great results! Would love to have a copy of Layered in my collection! So I can eat more cake for breakfast! My mom would always make cakes for our birthdays! I’m having my first baby in January and would love to continue the cake making tradition for my children! I’d love this book! The book would be fun because I love to bake (anything) and trying new recipes would be so much fun! I love how you can pick and choose components to create your own stunning cake! I always want a little of this and a little of that, so I feel like this will give me all sorts of skills. Need it because I turn 30 on August 30th and need a spectacular cake to celebrate. I really would love to know how to make these stunning cakes! I love baking. even now, when i’m sitting in the office, i’m thinking of the next cake what i’d like to do at home. Baking is like meditation for me. Turns off my mind for while.. and with a beautiful, tasty cake i can make happy at least one person. We all win! I would love to win this book! I usually bake cookies, but I would love to make more cakes and this book has so many beautiful cakes in it that I cannot wait to get started!!! This book looks perfect for someone who loves to bake – me! It also seems perfect for waking up our cake decorating imaginations! Not long ago I got really burnt out on baking (pun intended!). I wasn’t inspired and felt like I was just doing the same boring things over and over again. This book, however, is totally the boost that I need! I’m hoping to get better at making cakes for family and friends. I love to bake and would love to get better at layer cakes! Dinner should be edible, but dessert should be delicious and gorgeous! This book looks to be the answer on both counts! I love baking! I would love to have some fun new ideas for my daughter’s upcoming second birthday! I need those flamingoes! they would be perfect for a friends birthday! She has a gazillion flamingoes in her yard. Second, I read your posts regularly (I received your newsletter and RSS) and this is the first time I comment. You often post cakes’ photos and I’d like to say I’m pretty curious of your habits in US… In France we don’t have covered or layered cakes and this book could be the occasion to learn more about that so, I’ll take my chances !